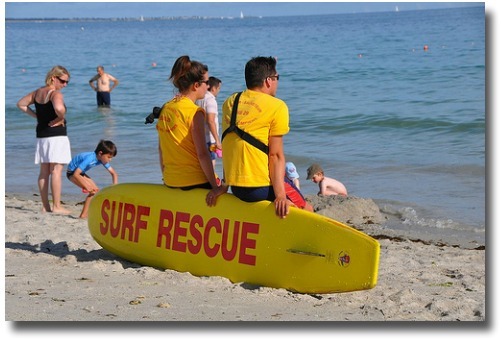 'Beachsafety' can simply mean a healthy observation of the weather, the tide, the beach patrols and local expert knowledge will keep you and your family safe. Arriving well prepared and well stocked up with everything you need is definitely the best way to avoid disaster. You learn to have a healthy respect for the ocean at an early age. The best lesson that you could ever learn is to observe the activities of the swimmers all around you and never to underestimate the forces of nature or overestimate your own ability. If you are not aware of your surroundings, then you run the risk of seriously hurting yourself or at worst, drowning. An inexperienced swimmer, unknown water conditions, an un-patrolled beach and inadequately prepared ... what a recipe for disaster! If you ever get caught in a rip or out of your depth, it can be a terrifying experience! How do I know? It happened to me! Somehow I managed to swim my way out of trouble and ended up exhausted, flopping in the shallows, way down the beach from where I had entered the water. You soon learn to have a really healthy appreciation for the blue and white breakers on any beach. 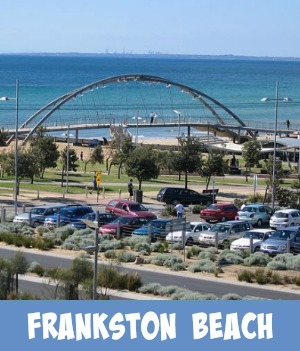 Most Bayside Beaches are patrolled weekends and public holidays. 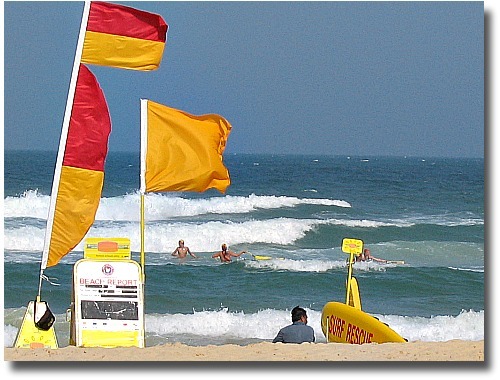 It is advisable to contact the local surf beach lifesaving club to see if the beach is being patrolled. The beaches are usually patrolled during peak holiday times for extra safety ... check anyway, better to be safe than sorry. For more information on which beaches are patrolled then visit or contact the local Tourist Information Center. The Lifeguards on duty know their beach and also where it is safe to swim. 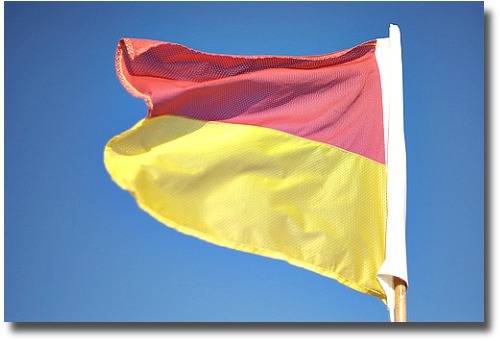 They place the red and yellow beach flags strategically where you are able to enjoy a safe swim. 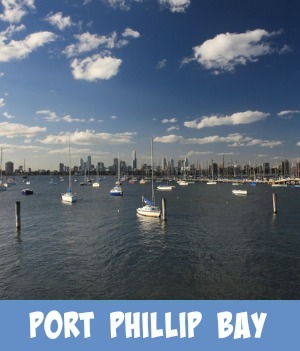 To stay safe when swimming these well patrolled areas, take note of where the flags are and swim in between them. Swimming outside this area may prove to be extremely dangerous due to unknown rips and tidal flows beneath your feet. So many times I have gone down to the beach and seen little kids, big kids and grown adults enjoying the beautiful sunshine but with absolutely no sun protection. 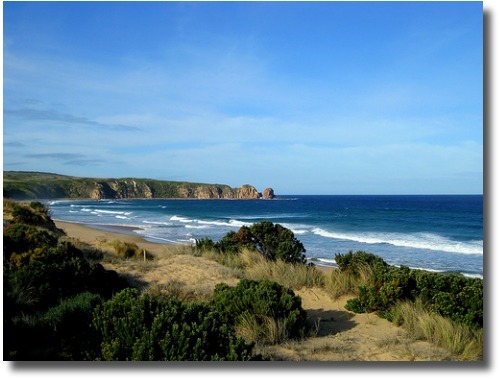 The Australian cry of Slip, Slop, Slap is the country's number 1 beachsafety tip. The Ozone layer has been badly compromised here in Australia, leaving over exposure to dangerous Ultra Violet rays a major concern. The sun is lethal and the damage that over exposure can create can be lethal. 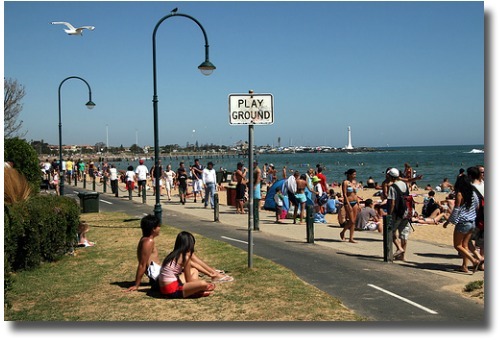 Melbourne's sun is strong, so much so that short amount of time out in it can burn the skin if it is not protected. If you are not protected it is said that it can take as little as 12 minutes of exposure to the sun for skin damage to occur. Just following some simple precautions can lower the risk of skin damage dramatically. The sunscreen lotions and sprays that we have today can help prevent a disaster. If possible apply 30+ broad-spectrum sunscreen 20 minutes before you go outside. Water resistant sunscreen is best for beachsafety if you are swimming or active in sport. 30+ sunscreen does not mean that we are able to spend longer time in the sun. It does protect you better than 15+ but 30+ sunscreen does not offer 100% protection from the UV Rays. 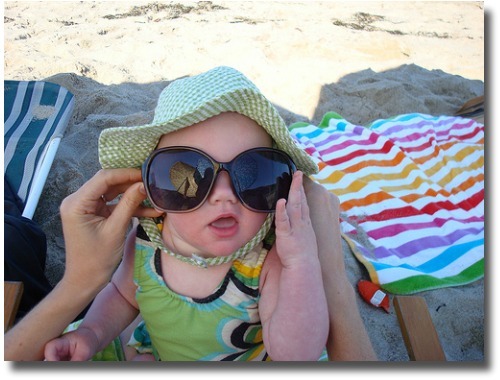 Because the Australian sunshine is so strong it is advisable for beachsafety to wear sunglasses. The glare from the water and the sun's reflection off the surface can possibly cause eye irritation and or damage. Protect your eyes with Australian Standard (AS1067) Sunglasses, you can purchase these at any Pharmacy or Department Store. Wear a broad-rimmed hat or even a legionnaires hat that covers the whole head, ears and neck. 6) For Beach safety, if out for long periods of time wear a shirt with a collar and long sleeves. Sometimes in Aussie heat this is uncomfortable to do however if you can then it is advisable to try. 7) Try to reduce the time that you spend outside during the hottest times of the day. In the hotter months try and arrange activities before 10:00am or after 3:00pm. 8) Don't fall into the trap that on cool and cloudy days you will or get burnt. UV Radiation will still occur. 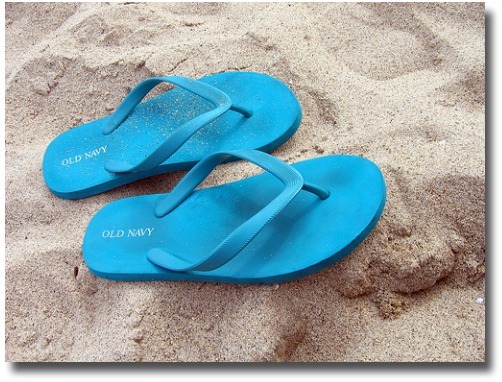 The sand can get pretty hot so be aware that you can actually burn the soles of your feet. For foot safety wear sandals or thongs for protection. 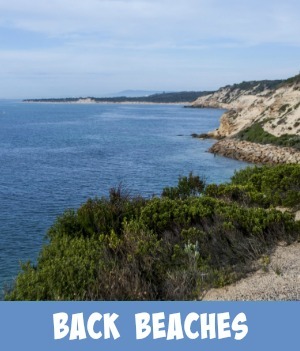 Another Beach Safety Tip is if you are beachcombing wear sneakers or if climbing over rocks strong hiking boots may be the best. The rocks are sharp and a nasty fall could result in a bad injury and a fast halt to your great day out. 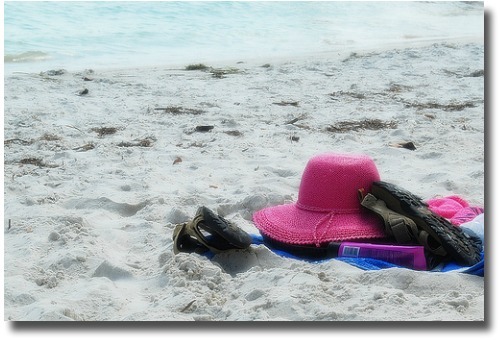 An important tip for beach safety measures is to drink plenty of fluids to replenish and refresh the body. 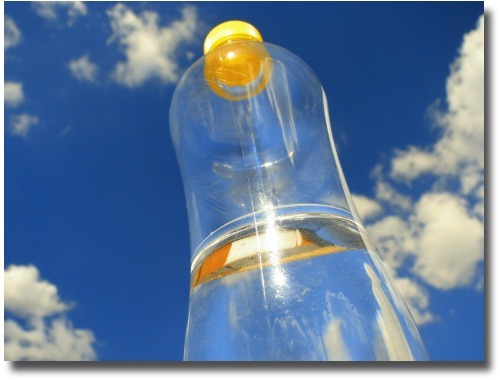 Heat exhaustion can be extremely dangerous and could lead to heat stroke. 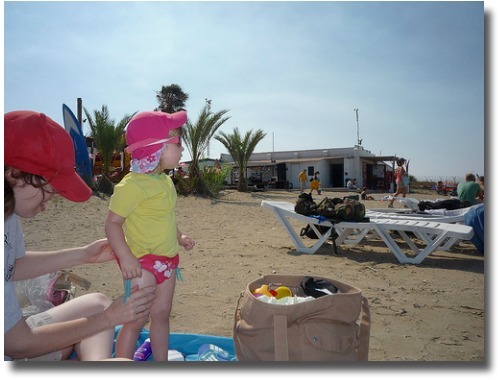 Follow these simple beach safety tips and you can be assured of having a great fun family getaway at the beach. 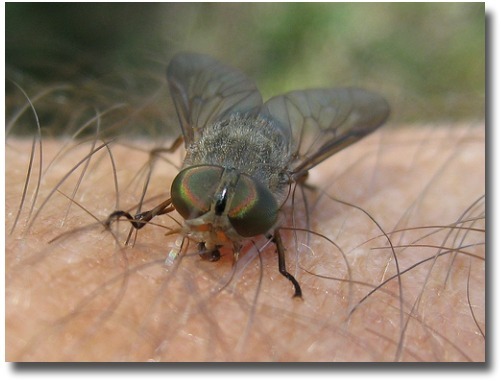 At certain times of the year the pesky march Fly invades Australian beaches and with it comes the chance of getting bitten by these obnoxious insects. The flies are strong swift fliers that tend to be more active throughout the summer months especially in still, open sunny areas. They bite suddenly, you don't even know they have landed and their bite stings! The best way to avoid this is to spray up with an insect repellent. There are roll on repellent brands available as well.